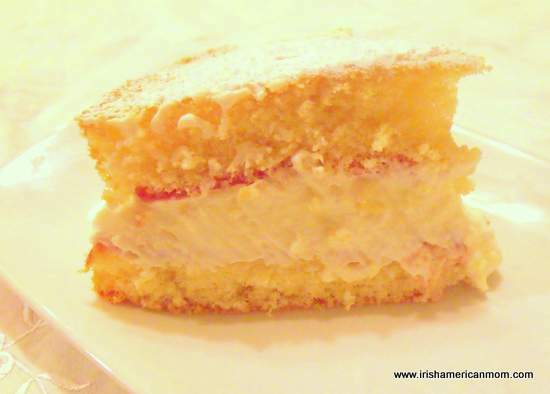 Irish sponge cake is a light and delicate egg sponge filled with a layer of jam and lots of luscious cream, with a light dusting of confectioners’ sugar on top. 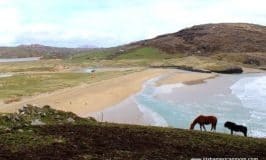 I loved this cake when I was growing up in Ireland. 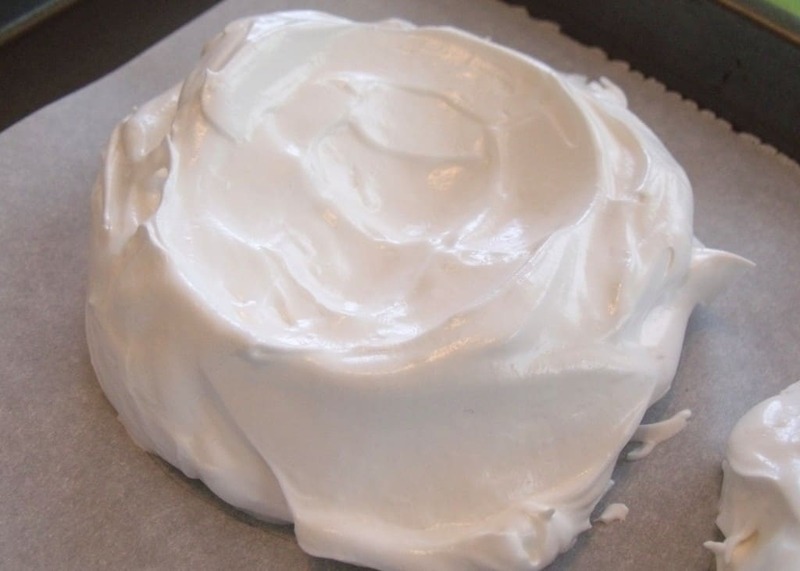 This cake recipe requires no butter. That’s right! 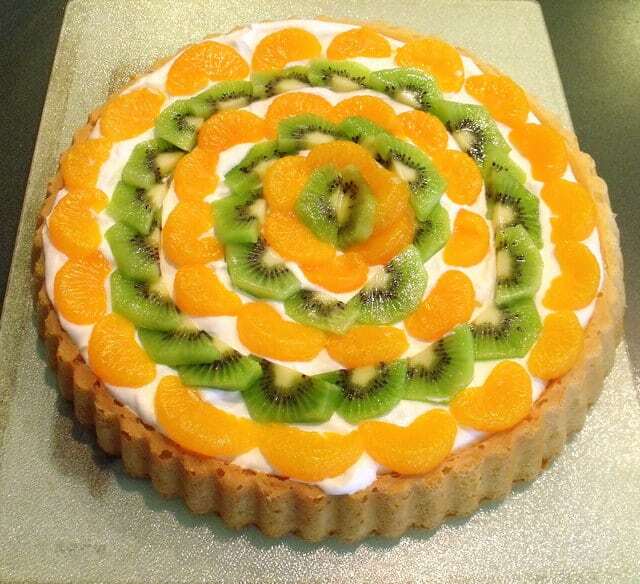 A butter free cake! 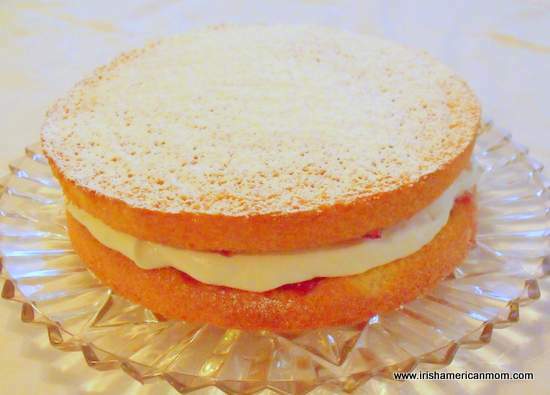 You may have heard of a Victoria Sponge Sandwich Cake which is similar to this cake, but it contains quite a bit of butter. 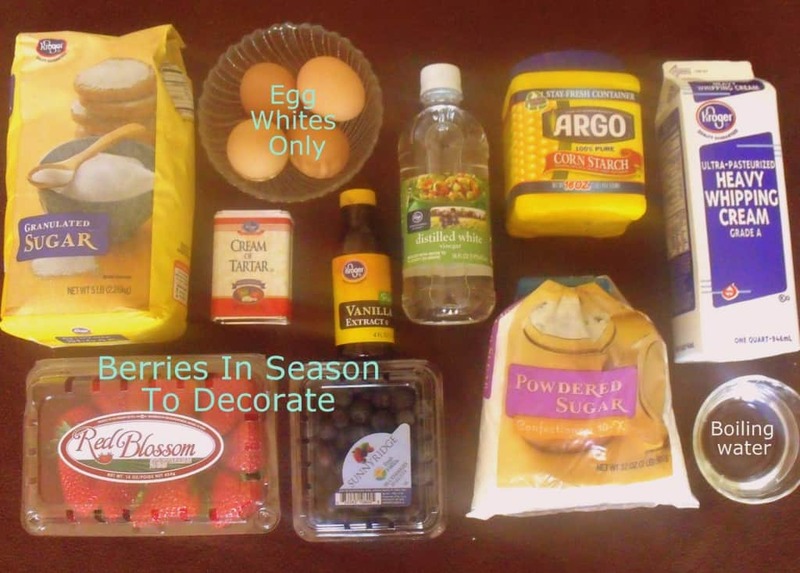 For butter free cake or sponge this is the recipe you need. 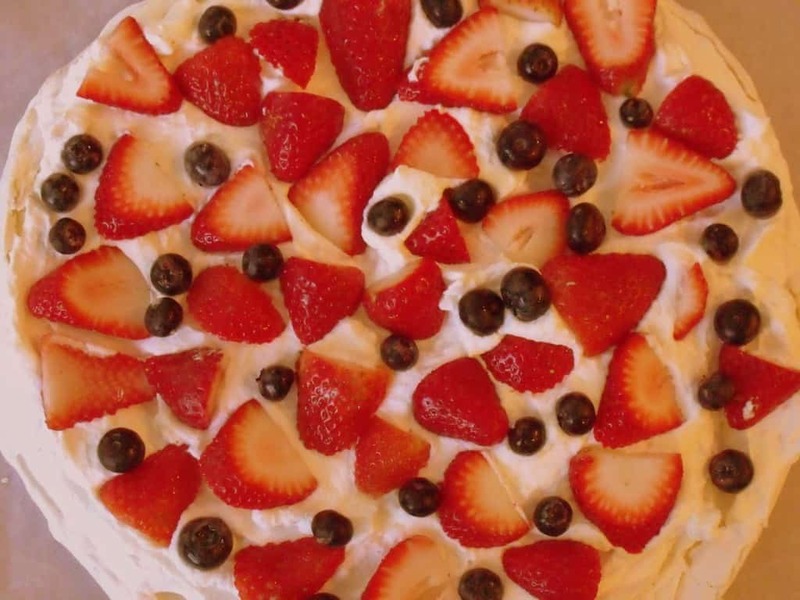 This is my Mom’s go-to recipe whenever she wants to make a quick, inexpensive cake that is relatively good for you. 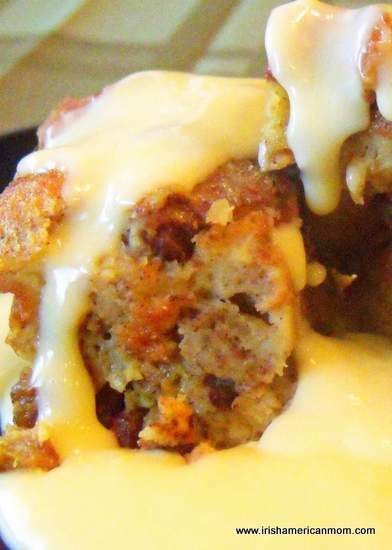 The recipe calls for four eggs, resulting in a protein-rich treat, disguised as cake. I confess I was easy to please as a child. 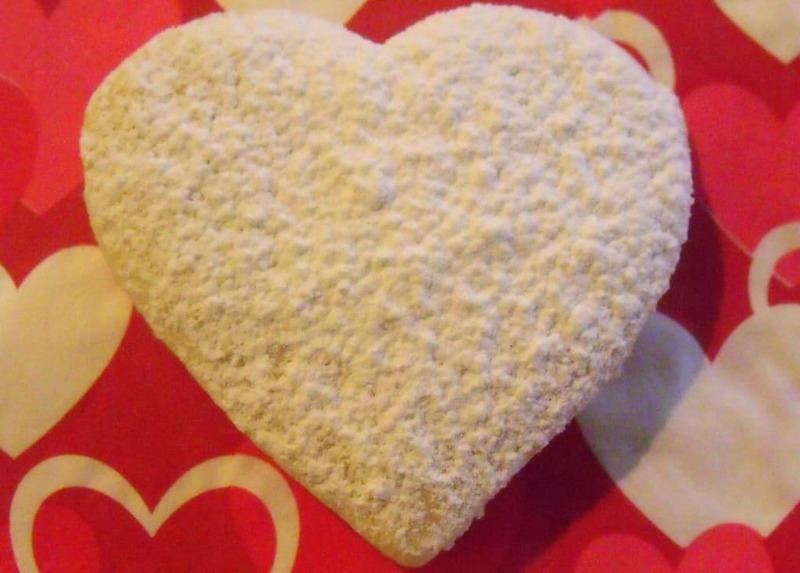 When my mom asked what kind of cake I wanted for my birthday I always requested this sponge cake. No frosting frenzy required for me. 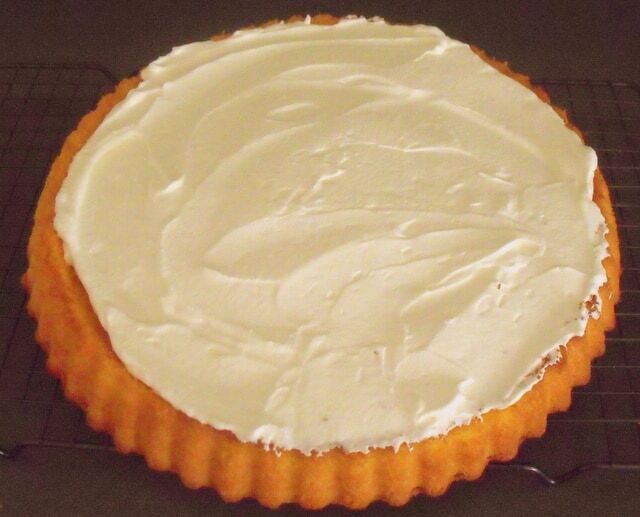 Just a simple dusting of confectioners’ sugar on this cream-filled delight, and I was as happy as a bee. 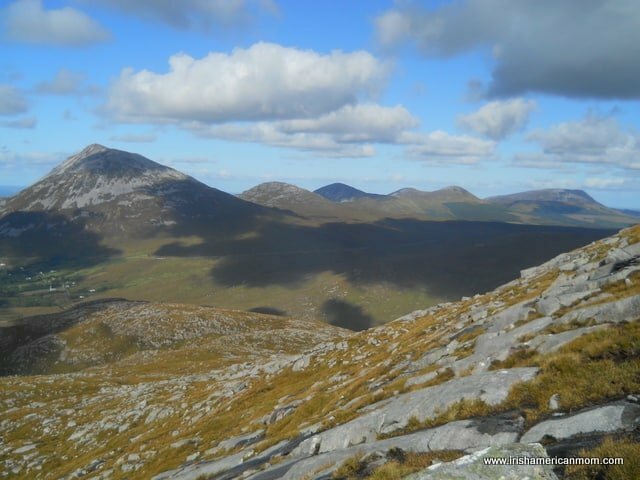 I loved to bake cakes when I was a teenager in Ireland. 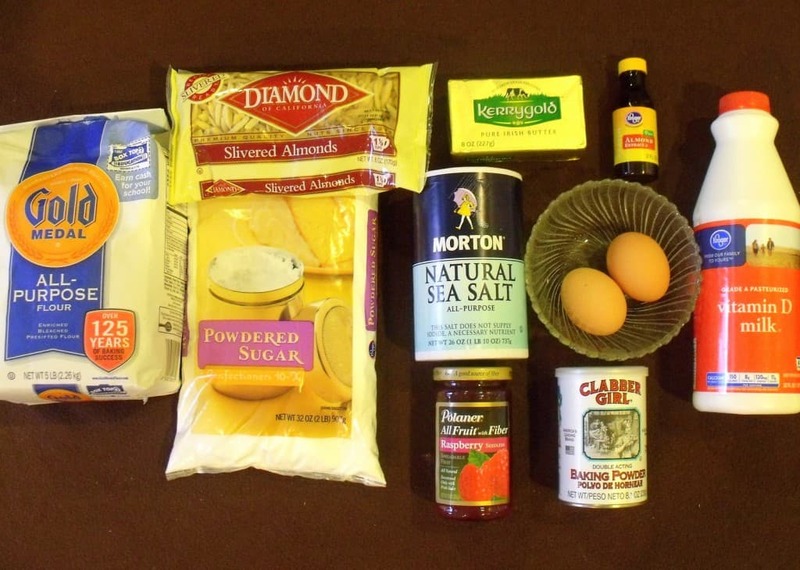 My Mom’s sponge cake recipe was easy to remember – 4 eggs, 4 ounces of sugar and 4 ounces of flour. 4-4-4 made it ever so simple. 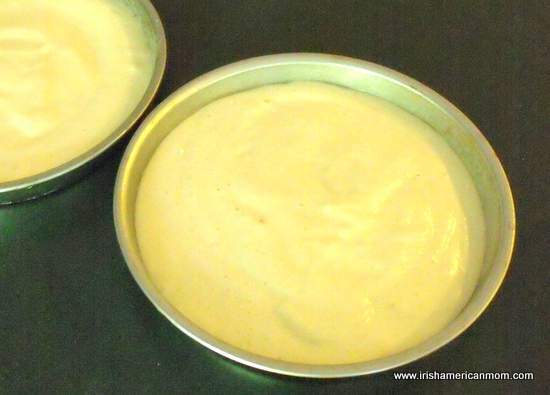 Not so simple when I came to America, and tried to replicate my Irish cake baking successes. My first attempts were a complete failure. 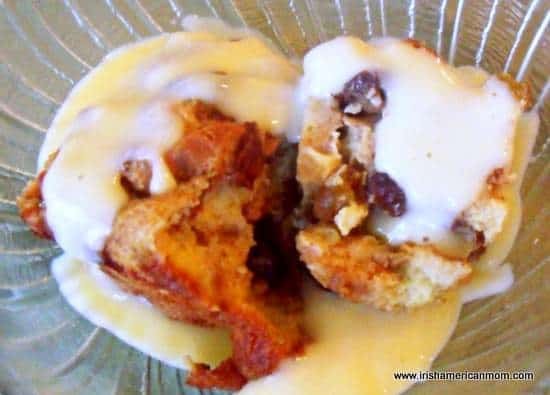 I used 4 eggs and 1/2 cup of both sugar and flour. It took me a while to realize that 4 ounces of sugar is a half cup, but that flour is significantly lighter than sugar. I needed 3/4 cups of flour, plus an additional 2 tablespoons to achieve the exact same ratios as in my mother’s recipe. 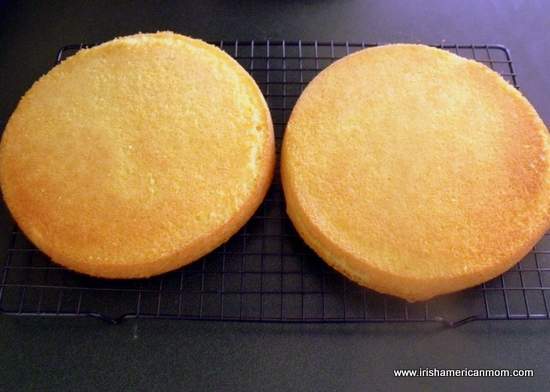 Sponge cake success is dependent upon beating as much air as possible into an egg and sugar mixture to ensure the cake rises when it hits the heat of the oven. 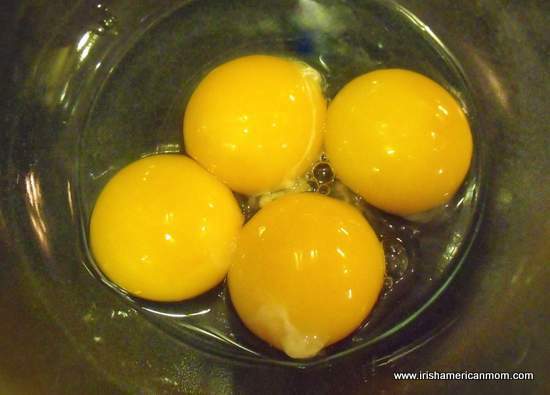 Make sure your eggs are at room temperature before beating them. Cold eggs do not hold as much air. 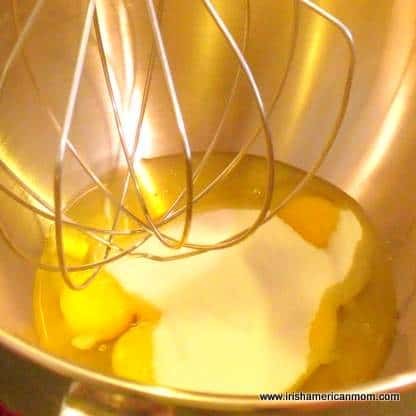 Add the eggs and sugar to the bowl of an electric mixer. 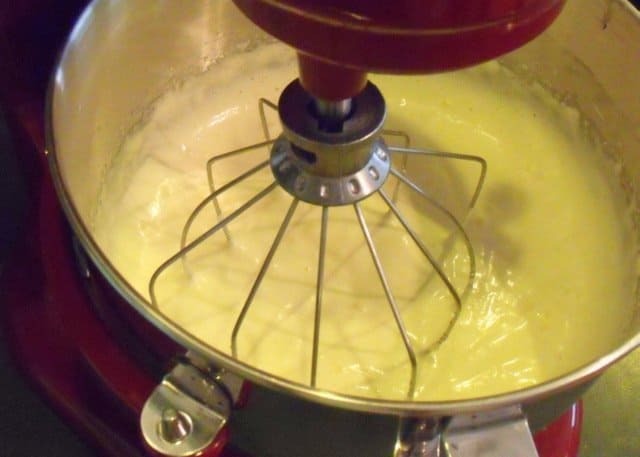 Turn onto high and let the mixer perform its magic. 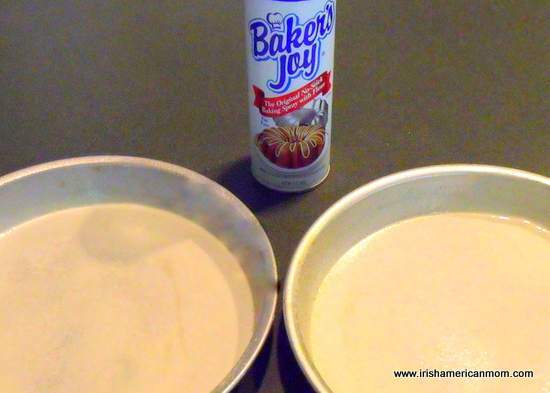 While the mixer is busy beating up those eggs and sugar, prepare two 9-inch round baking pans by spraying them with non-stick spray infused with flour. I love this stuff! 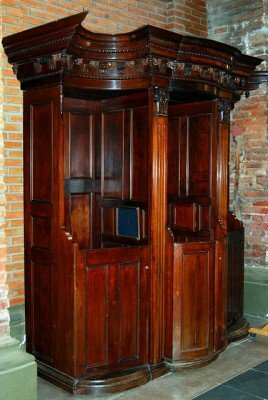 It is so much easier than the old fashioned way. 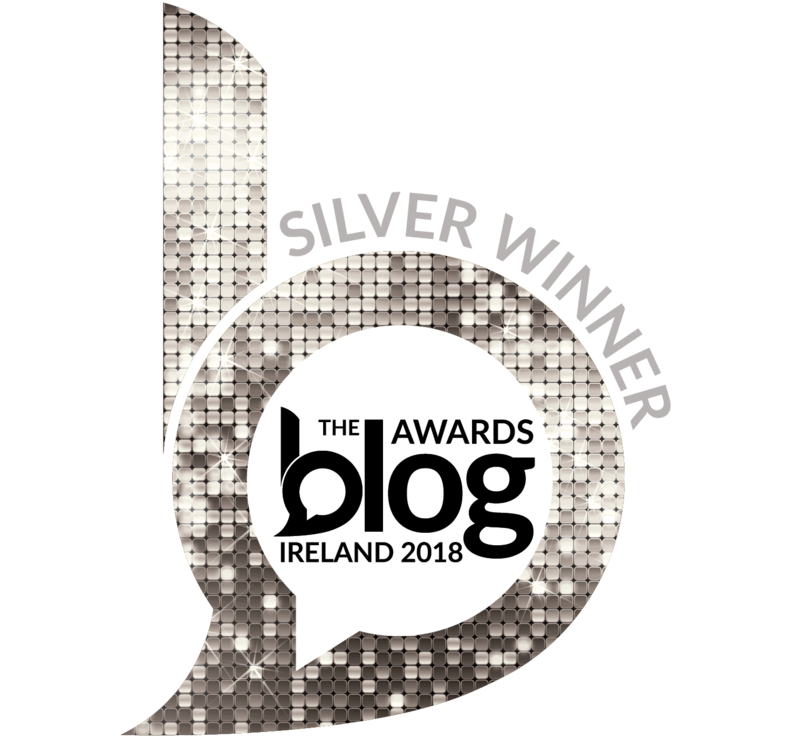 We used to grease the pans with an old butter wrapper, then add flour and tap it around the pan to completely coat the buttery surface in a thin white layer of flour. Now that awkward job has been transformed into a few quick spritzes with this miraculous floury spray. Hats off to whoever invented this stuff! 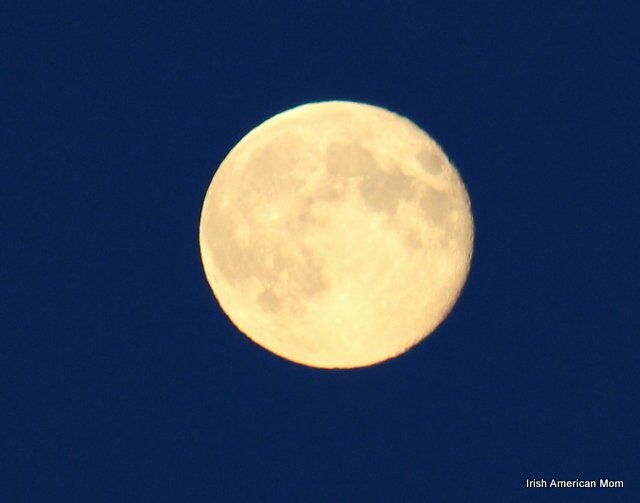 You have my eternal gratitude. 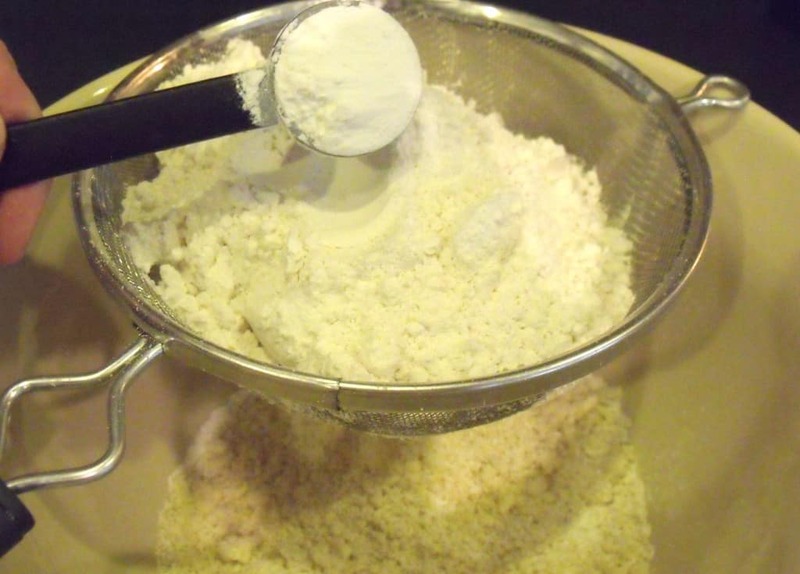 Next prepare the flour by sifting it with the baking powder. My mom does not use any baking powder at all, but I find that just 1/8 of a teaspoon helps when using American flour. Always sift the flour. 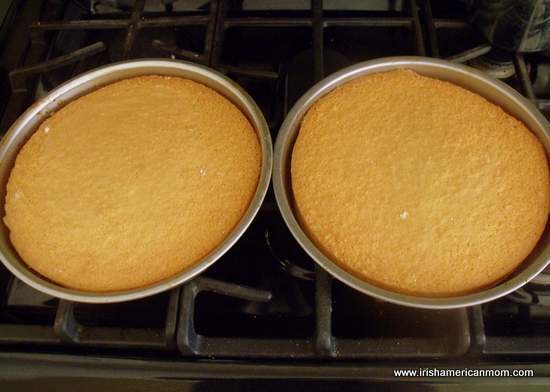 The process adds air to the flour mixture, helping create a lighter sponge cake. 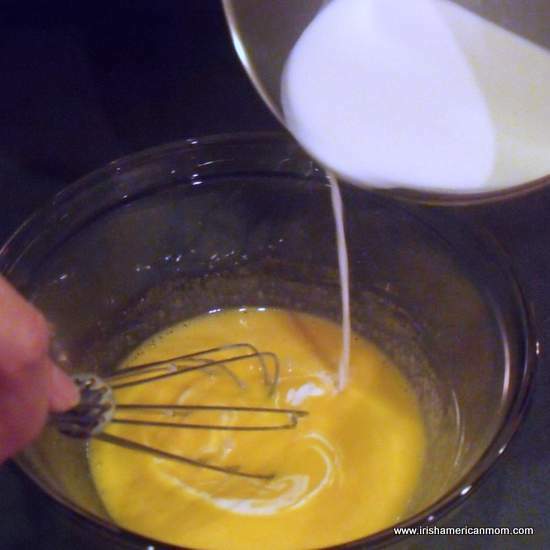 The egg and sugar mixture will increase in volume many times over as it gets whipped up with air. 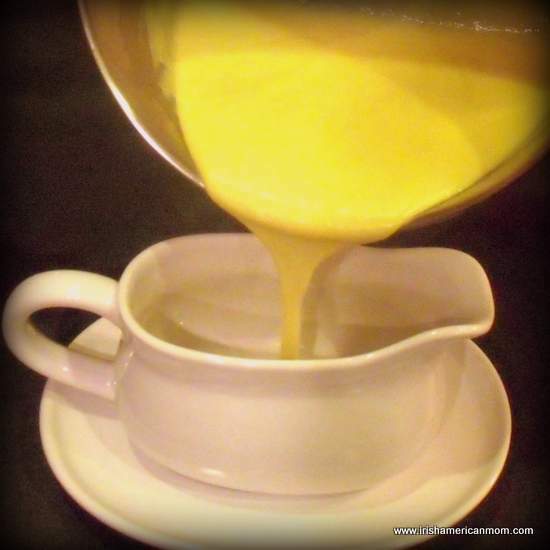 It takes anywhere from 6 to 8 minutes depending on the power of your mixer to achieve a thickened, glossy consistency. 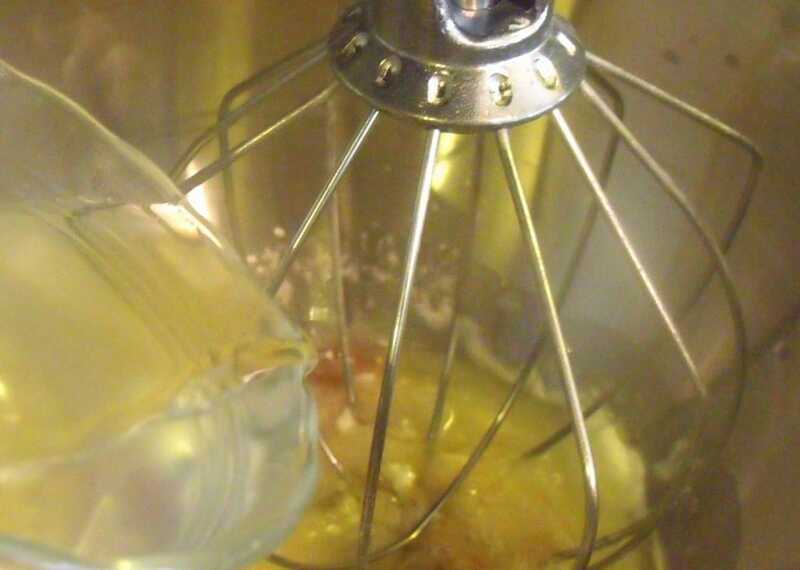 When the egg mixture is ready the beater will be leaving markings on the mixture as it turns, and the mixture’s color will be a very, very pale yellow. 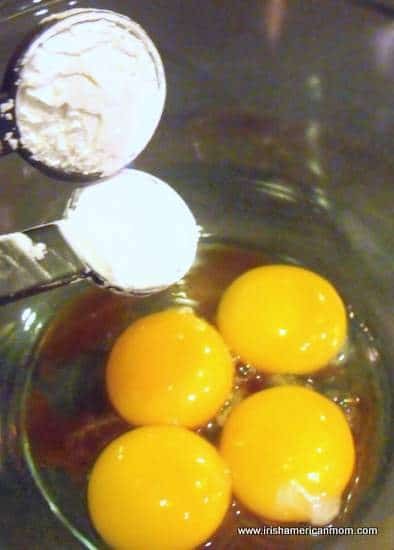 Spoon half the flour into the egg mixture. Using a spatula, gently fold in the flour. 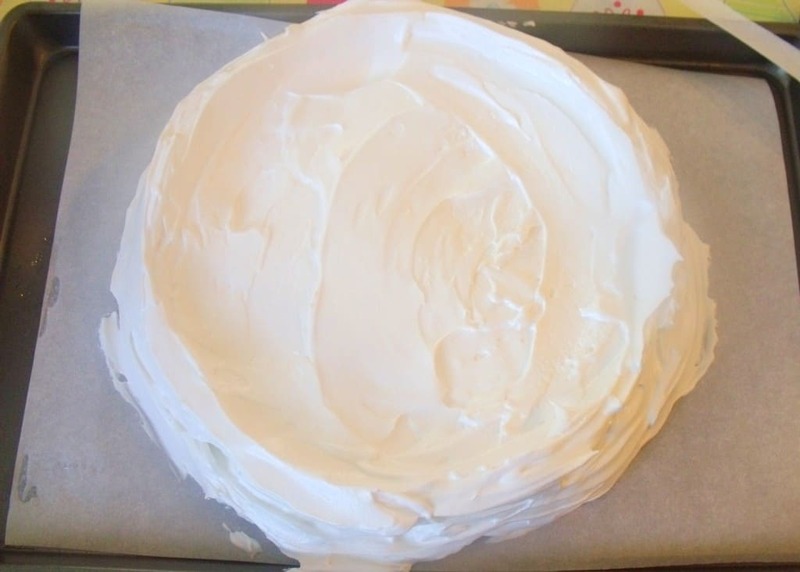 Do not use the electric mixer to add the flour, since this would deflate all the lovely air pockets that will help the cake to rise. Add the vanilla essence at this point if you like the flavor. 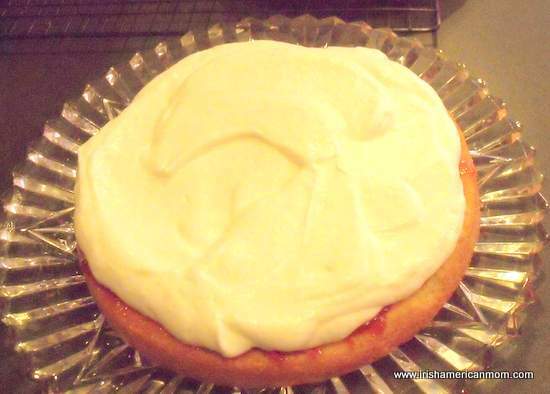 I never add vanilla – it is not a sponge cake flavor I grew up with. Add the second half of the flour and again fold it in gently. 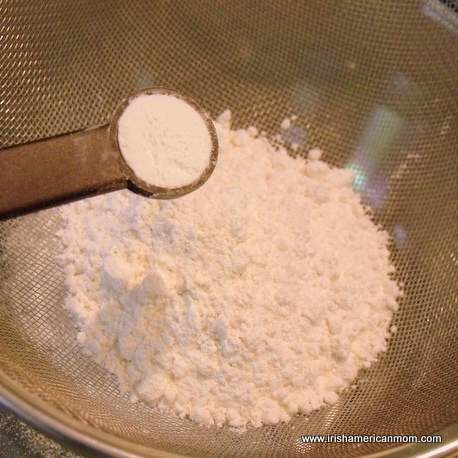 Make sure to lift the mixture from the very bottom of the bowl as you fold in the flour. 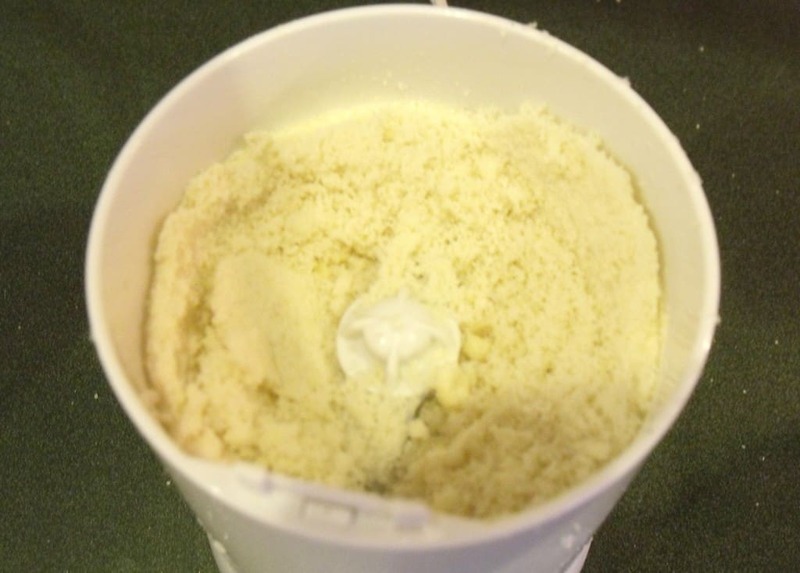 This will release air pockets of trapped flour like the one pictured above. When the flour is fully incorporated pour half the mixture into each of the prepared baking pans. 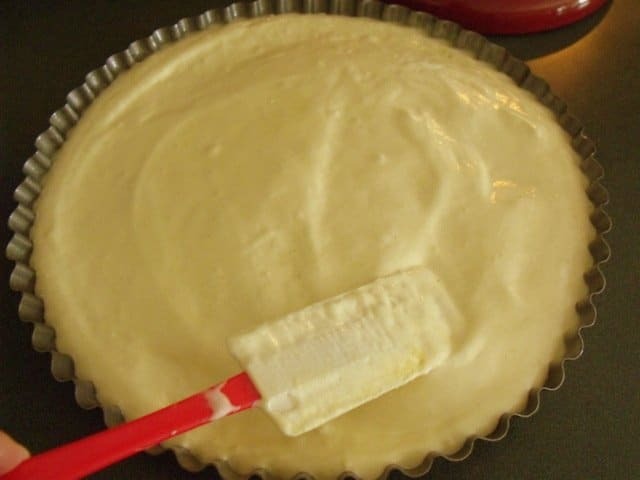 Spread it out evenly using the spatula. 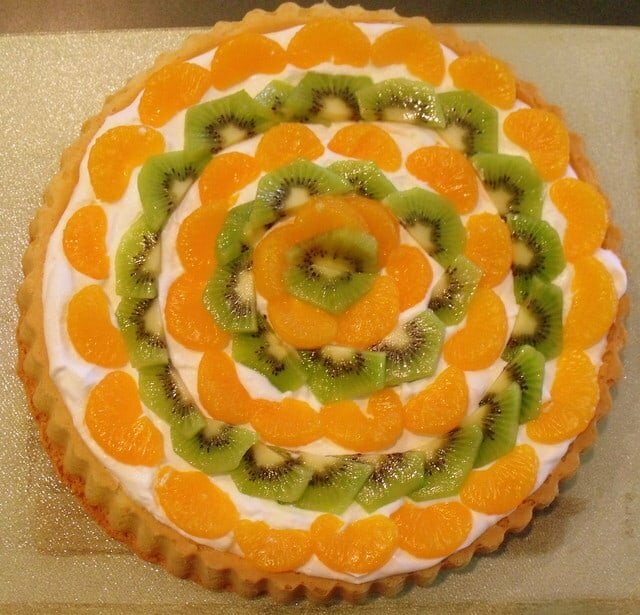 Place the cake pans in the pre-heated oven and bake for 15 minutes at 375 degrees and then reduce to 350 degrees for a final 10 minutes. 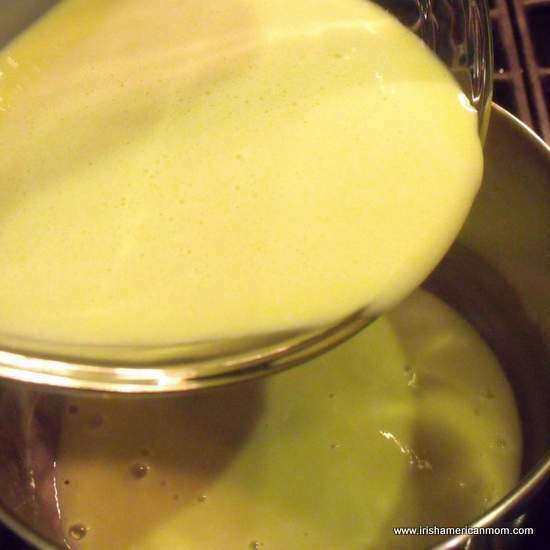 When cooked the cakes will be a light golden color and will be slightly springy to the touch. When touched with a finger tip, no indentation will remain. 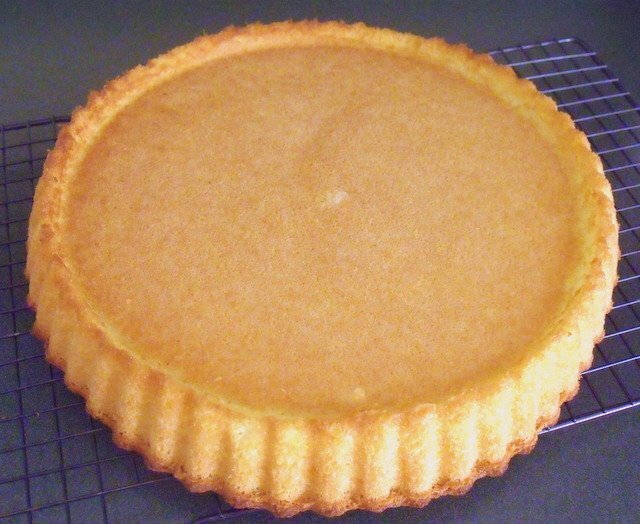 Use a knife to loosen the edges of the sponge layer from the side of the cake pan if necessary. 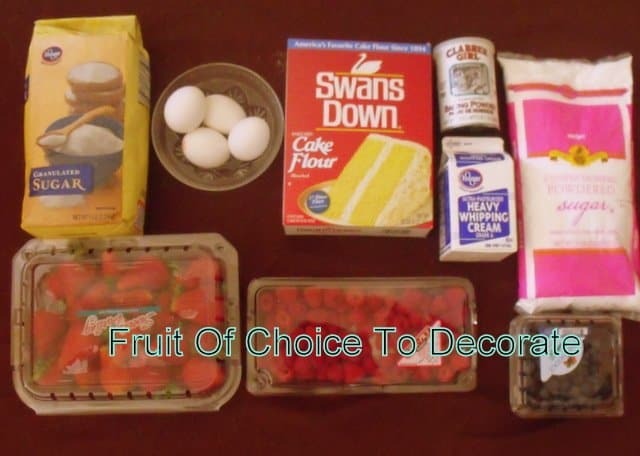 Turn the cakes onto a wire rack to cool. 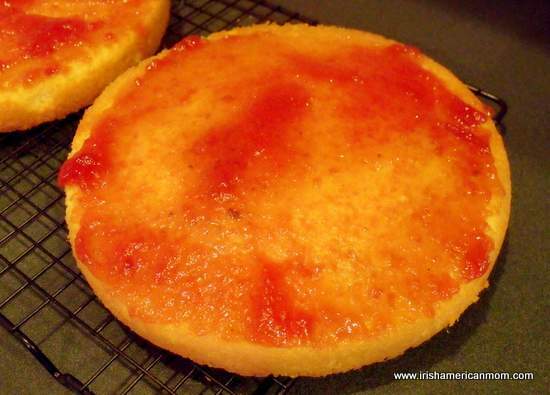 Spread a 1/4 cup of jam on the inner aspect of each sponge layer. 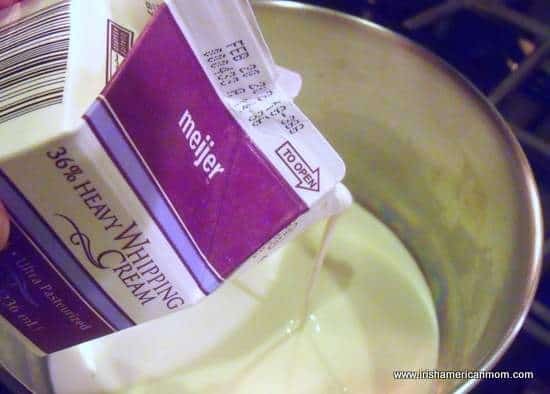 Beat the heavy whipping cream in a mixing bowl using an electric mixer, until the cream is thick and easy to spread. 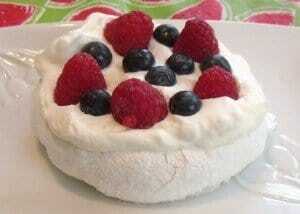 Add 1 tablespoon of confectioners’ sugar to the cream if a sweeter taste is desired. Place the lower layer of the sponge on a serving plate. 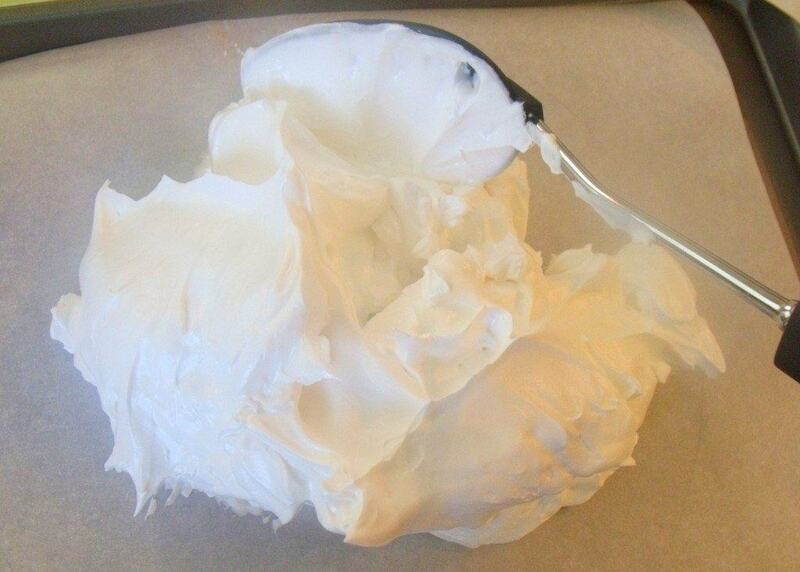 Cover the jam with a thick layer of cream. 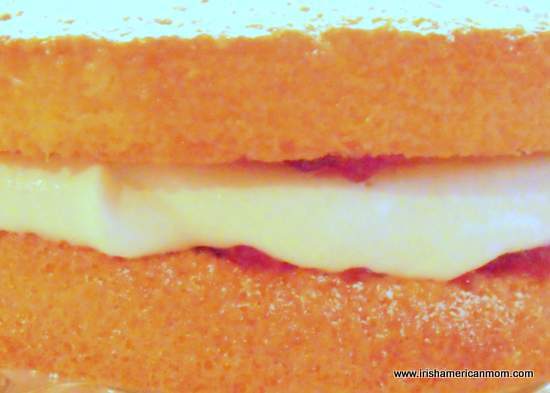 Place the top sponge layer on top of the cream, to create a jam and cream sandwich. 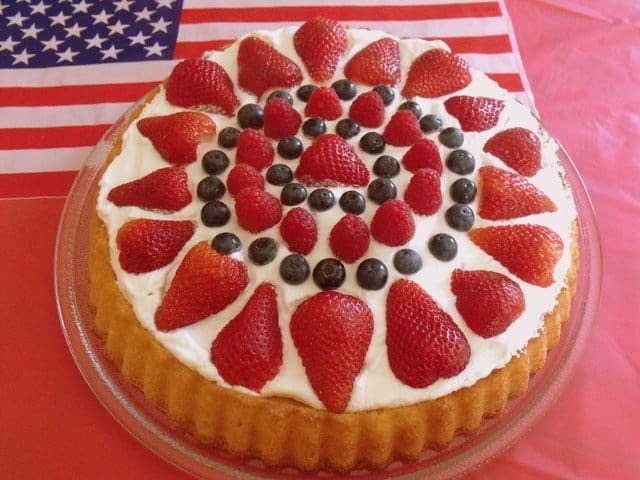 Decorate the cake with a light coating of confectioners’ sugar sifted on top. 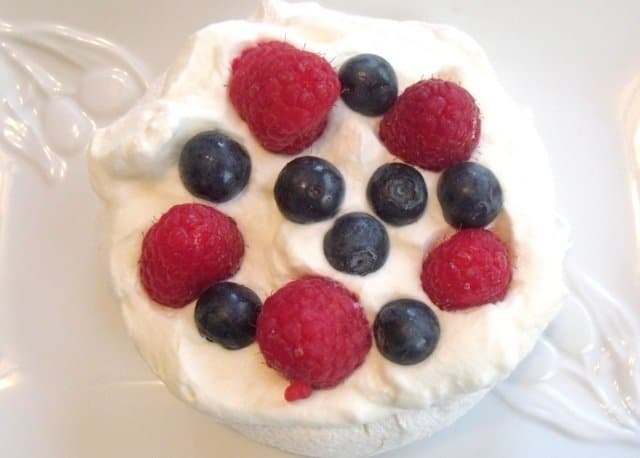 Slice and enjoy this light, delicate cake with jam and luscious cream. My little girl announced tonight, that sponge cake is her favorite cake in the whole wide world. It’s her Mommy’s favorite cake too. 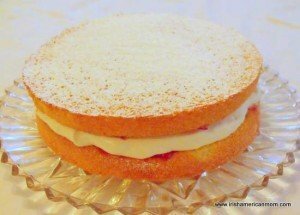 An Irish Sponge Cake is a light and delicate egg sponge filled with a layer of jam and lots of luscious cream, with a light dusting of confectioners' sugar on top. Step 1 Preheat the oven to 375 degrees Fahrenheit. 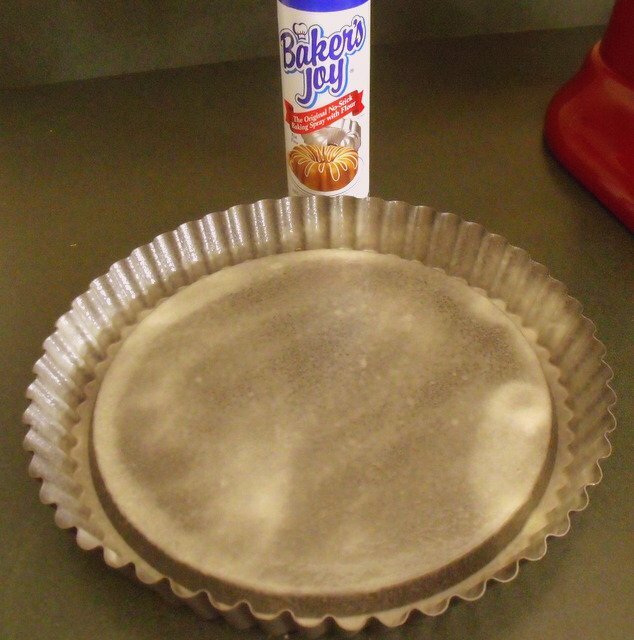 Spray two 9-inch round baking pans with non-stick spray infused with flour, or grease with butter and dust with a light coating of flour. 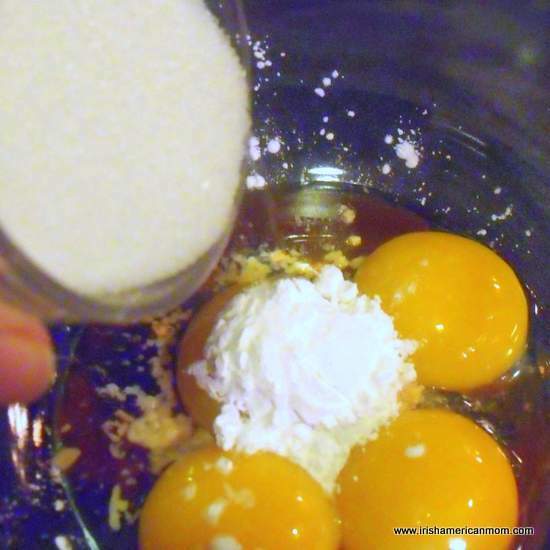 Step 2 Add the eggs and sugar to a large mixing bowl. 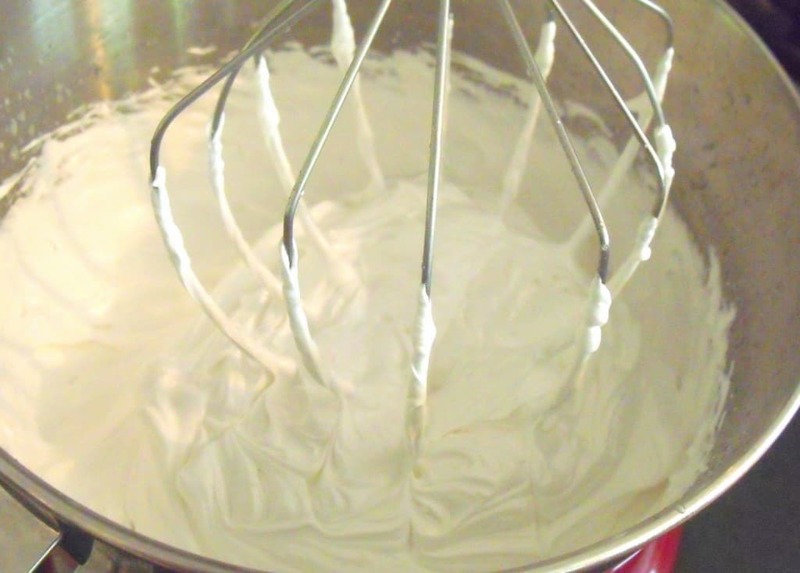 Using an electric mixer, beat the eggs and sugar for 6 to 8 minutes until the mixture has increased in volume and thickened to a consistency of whipped heavy cream. Step 3 In a separate bowl sift the flour and baking powder together. 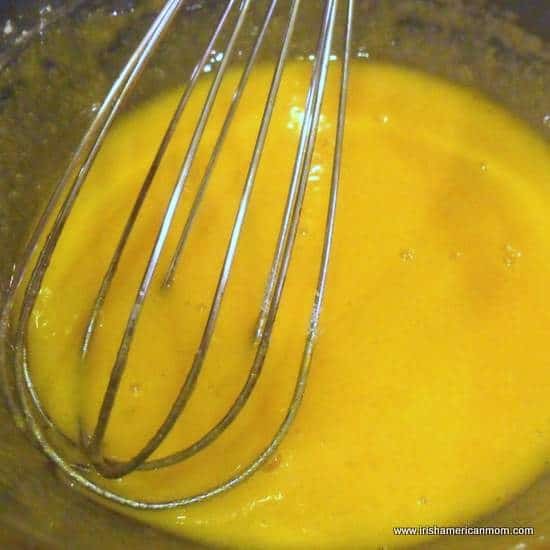 Spoon half the flour into the egg mixture and gently fold it in using a spatula. Repeat with the second half of the flour, folding gently to fully incorporate the flour. Add the vanilla essence with the flour if desired. Step 4 Pour half of the cake mixture into each of the prepared baking pans. 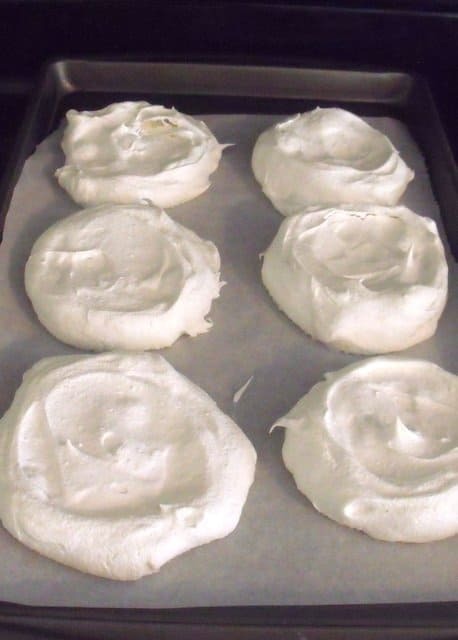 Bake in the preheated oven at 375 degrees Fahrenheit for 15 minutes, then reduce the heat to 350 degrees and bake for an additional 10 minutes. 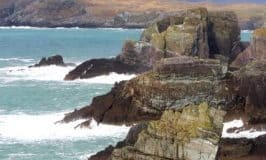 The sponges will be golden brown, with a slight spring to the touch when cooked. Step 5 Remove the sponges from the oven and cool on a wire tray. 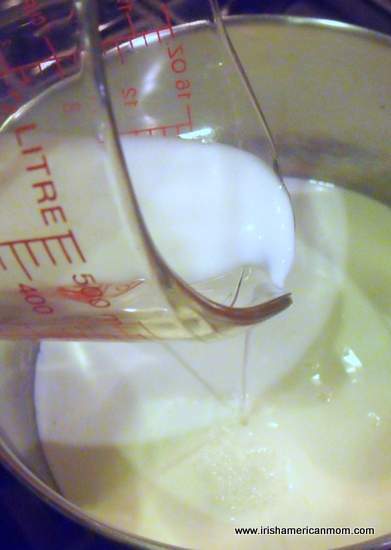 Step 6 Whip the heavy cream using an electric beater until thick. 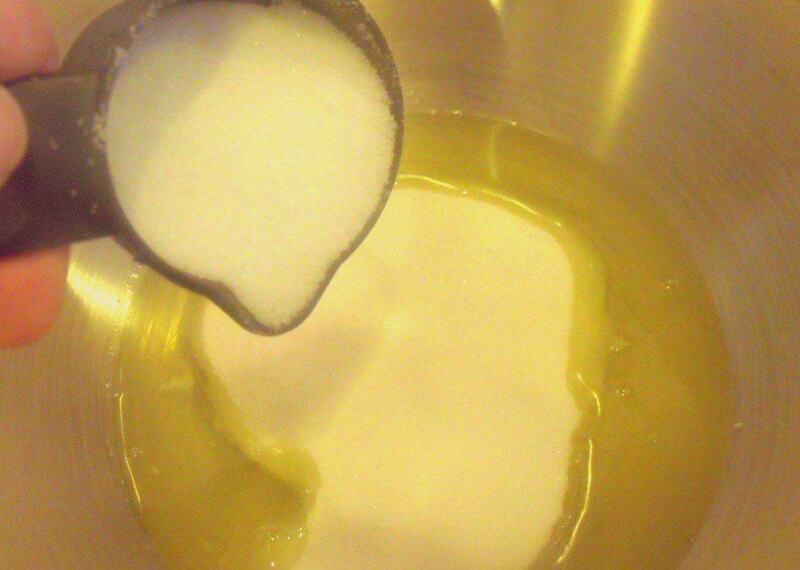 Add one tablespoon of confectioners' sugar to sweeten if desired. Spread jam on the inner surface of each sponge. 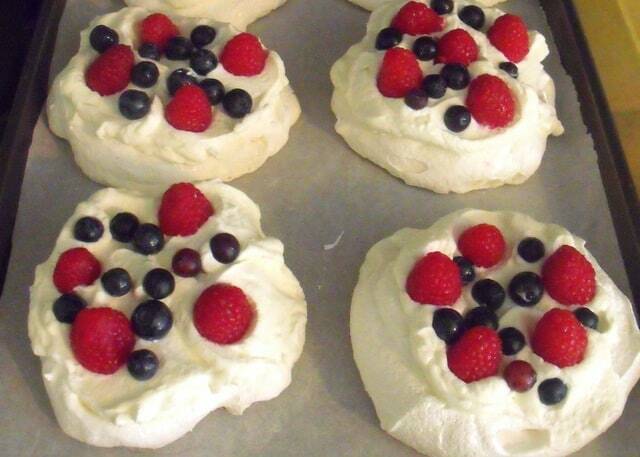 Place one layer on a plate, spreading the cream over the jam. 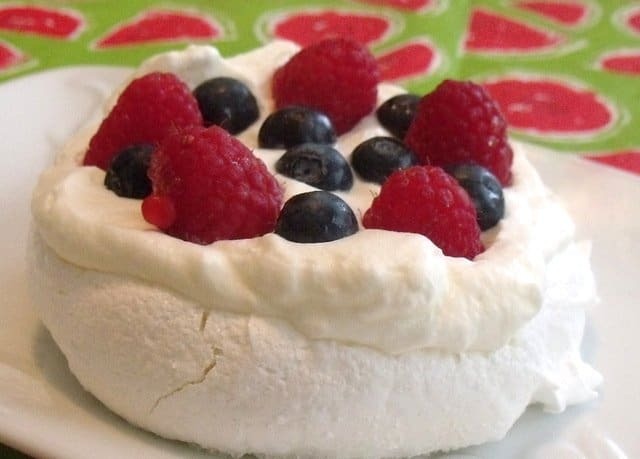 Sandwich the cream with the upper sponge layer. 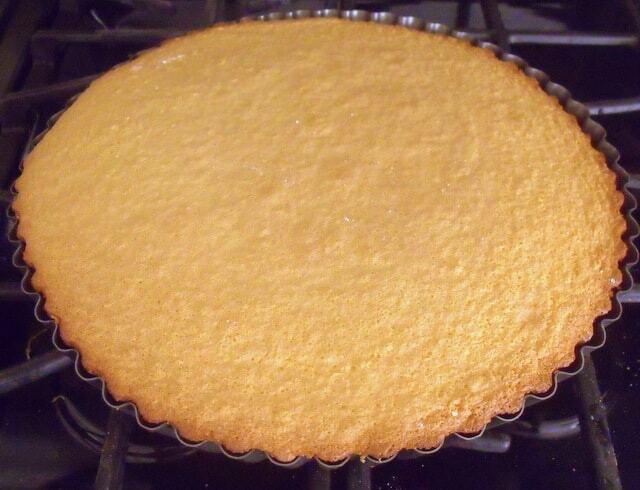 Step 7 Decorate by sifting a fine layer of confectioners' sugar on top. Slice to serve. 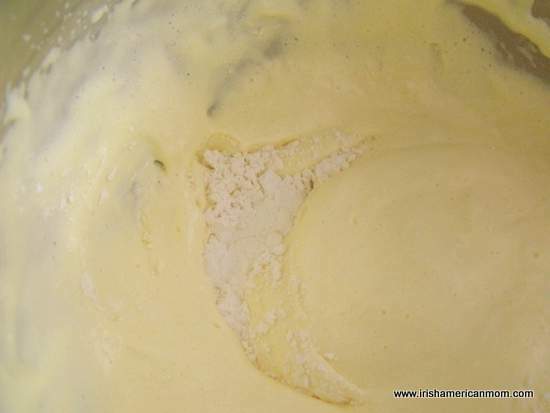 Ground almonds are used extensively in Irish baking. 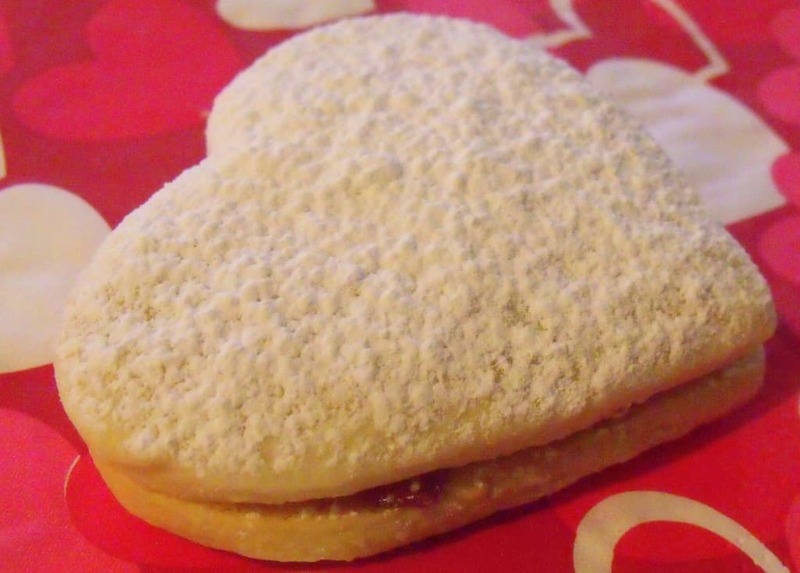 Basic almond cookie dough cut into heart shapes, then sandwiched with raspberry jam and decorated with a dusting of confectioners’ sugar are a perfect treat for Valentine’s Day. 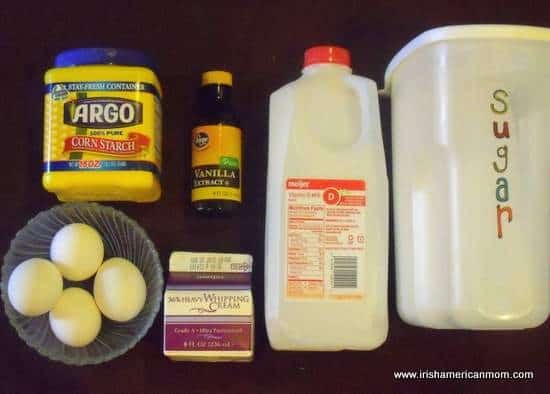 I like to use 1 egg and milk to bind this dough, but if you prefer you can use two eggs and no milk for a softer cookie. Ground almonds are not always readily available in American stores. Sold as almond meal, it is often only found in the specialty or organic aisles of the grocery store. I find it easier to make my own using a coffee grinder. 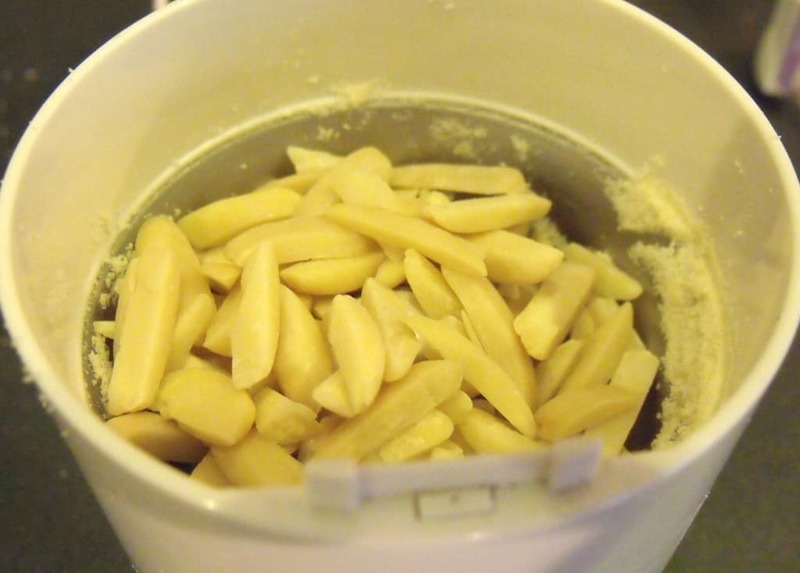 I add slivered almonds to the grinder 1/3 of a cup at a time. Pulse it for about 20 seconds to produce a finely ground meal. 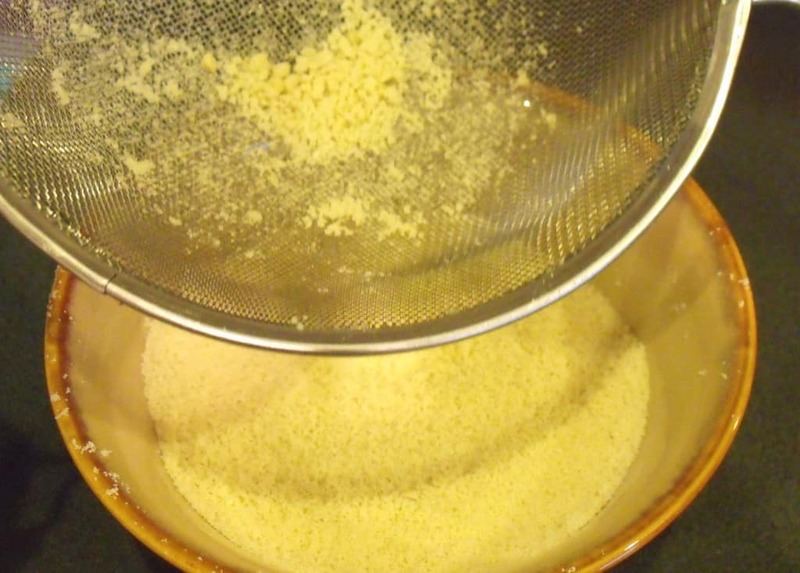 I sift it to remove any little almond pieces that may have missed the grinder’s blades. 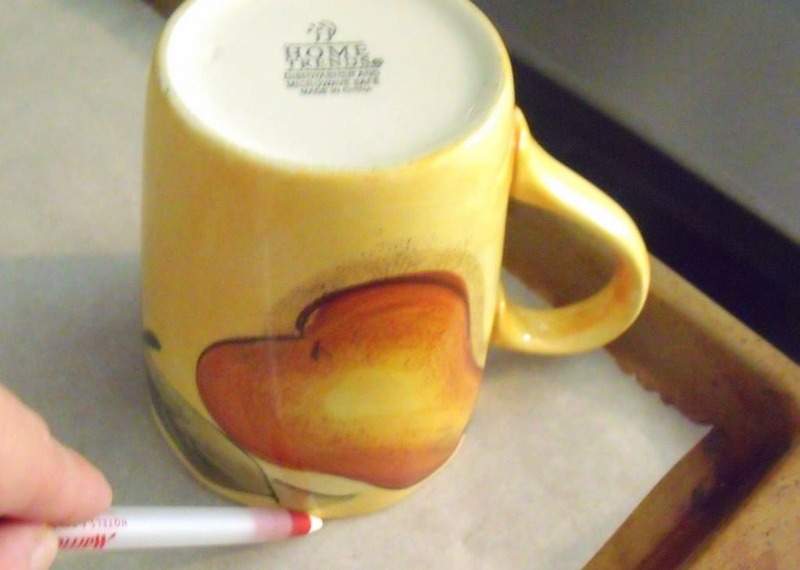 A little under a cup of slivered almonds produces 1 cup of ground almond meal. 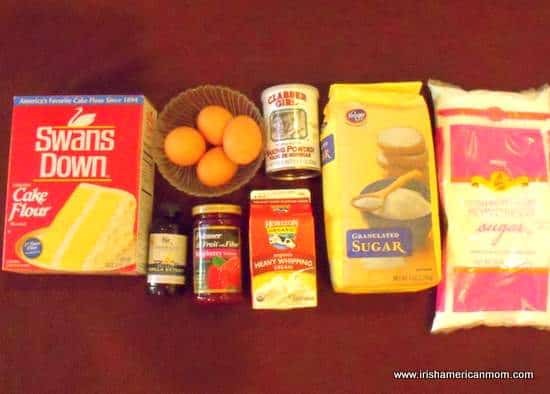 To make the cookie dough cream two sticks of butter together with 1 cup of confectioners’ sugar or icing sugar as we call it in Ireland. 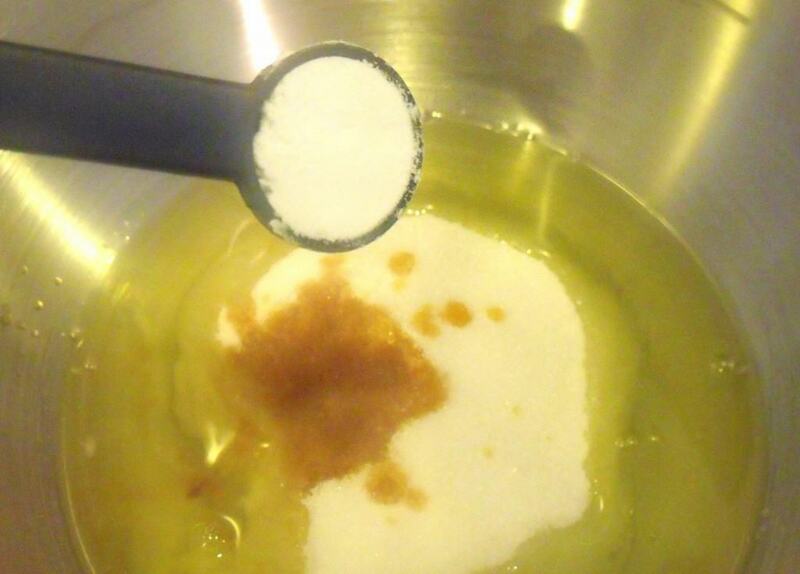 When the butter and sugar are light and fluffy add one teaspoon of almond essence. Feel free to add an additional teaspoon if you really like the flavor of almonds. Add one egg, mixing it into the butter and sugar mixture. Sift the flour, baking powder and salt into a separate bowl with the ground almonds. Mix all the dry ingredients together. 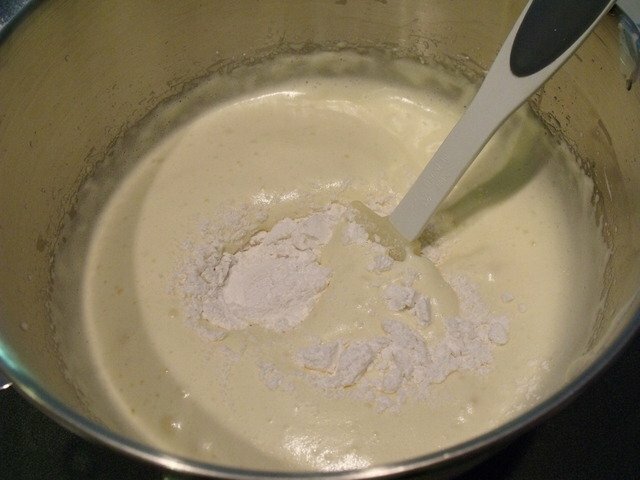 Add the flour and almond mixture in thirds with one tablespoon of milk at a time. 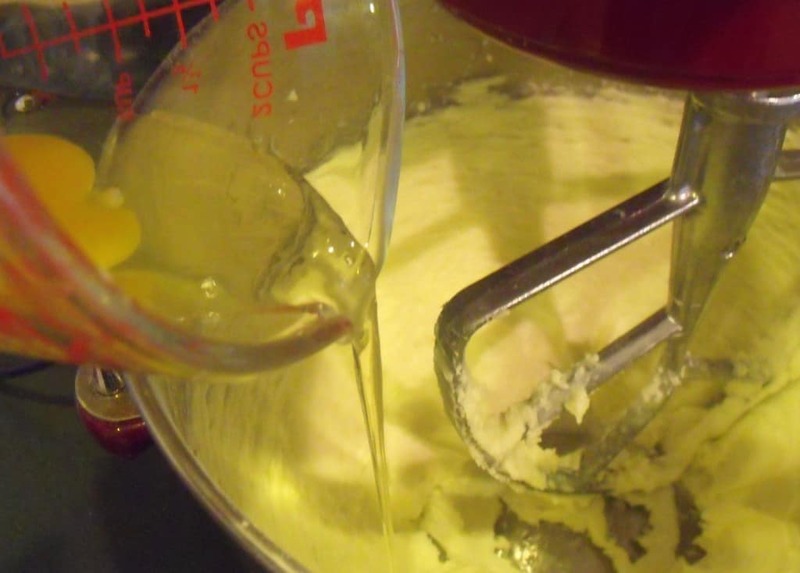 Blend together on a slow speed to form a dough. 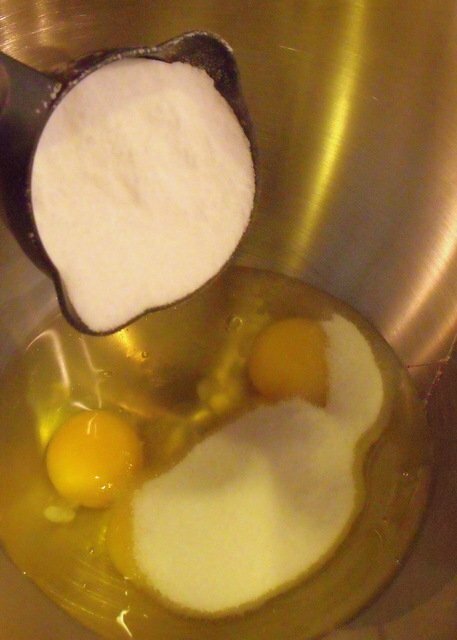 If you are using two eggs for a softer cookie, omit the milk. 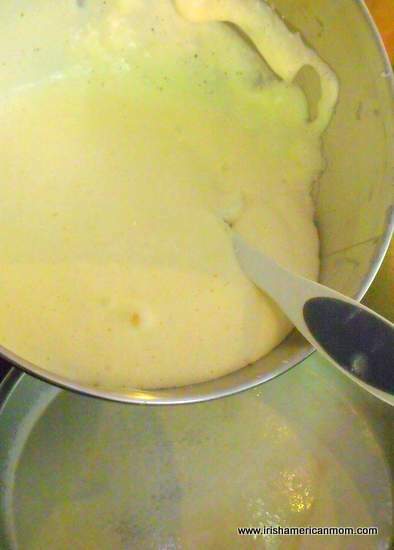 A firm dough starts to form after mixing in the last third of the dry ingredients. 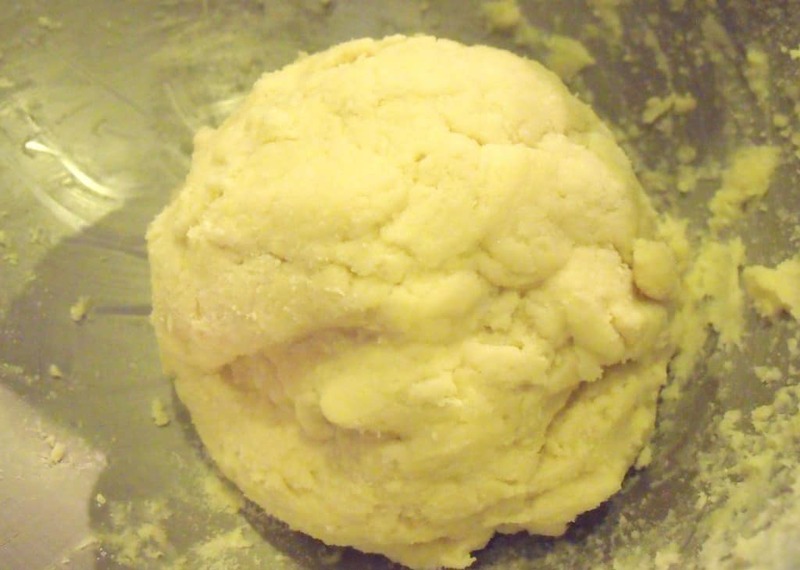 Use your fingers to form a round dough ball. 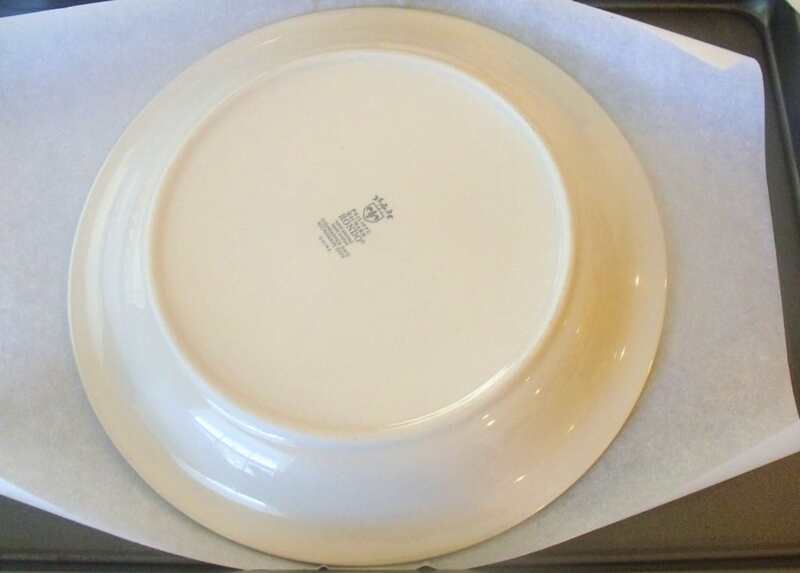 Cover the dough with plastic wrap or parchment paper and place it in the refrigerator for a minimum of two hours. Cookie dough is best handled and rolled when cold. When you are ready to bake your cookies, preheat the oven to 350 degrees F. Dust a flat surface for rolling with confectioners’ sugar. 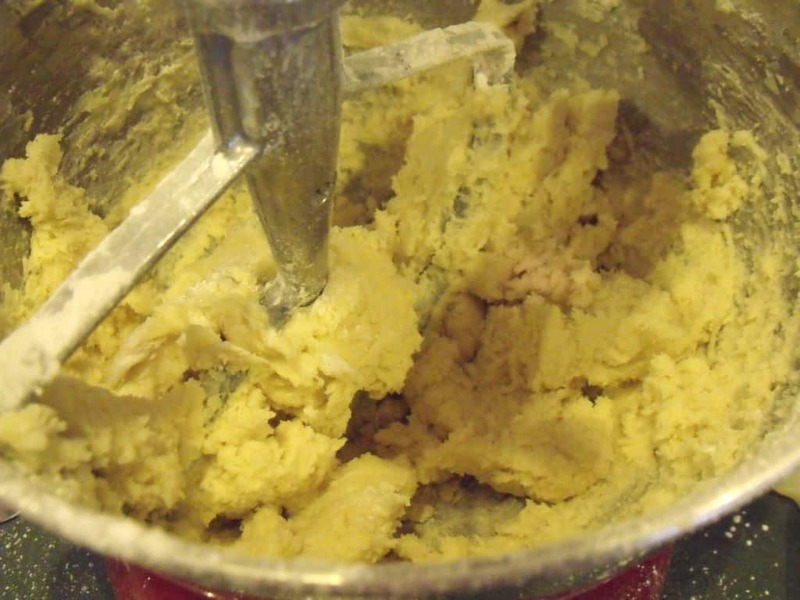 I like to use sugar rather than flour, since too much flour makes the cookie dough too dry. I cut the dough ball in two, then rewrap the other half and put it back in the refrigerator to keep it cold, while I get to rolling and cutting. 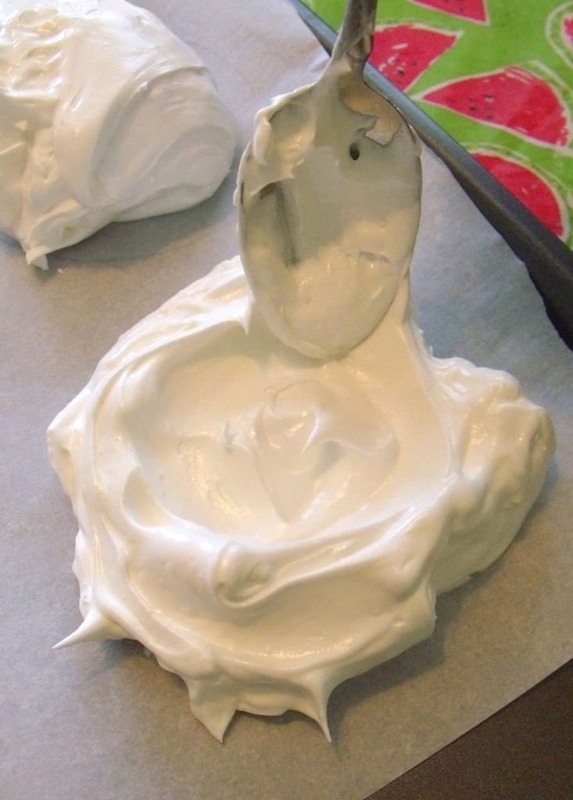 Roll the dough to about 1/8″ to 1/4″ thickness. 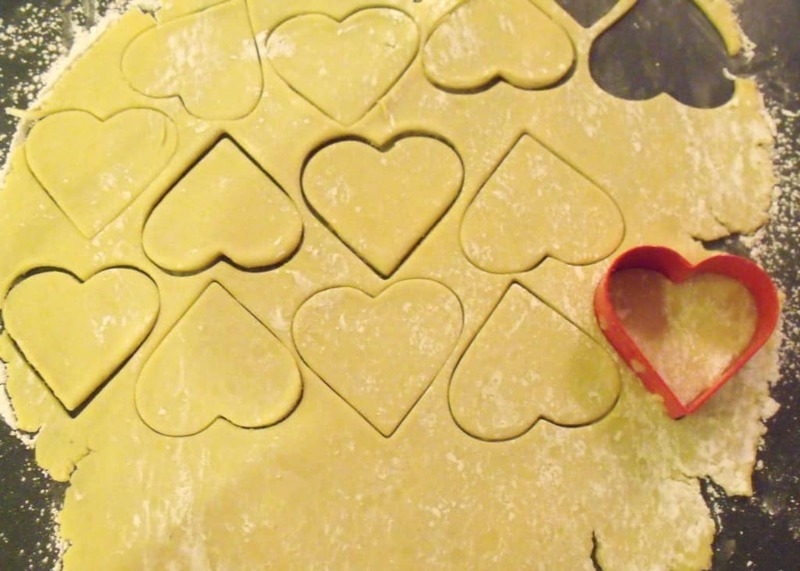 Using a heart shape cookie cutter cut out the shapes. My cookie cutter is 3 inches across at its widest point. 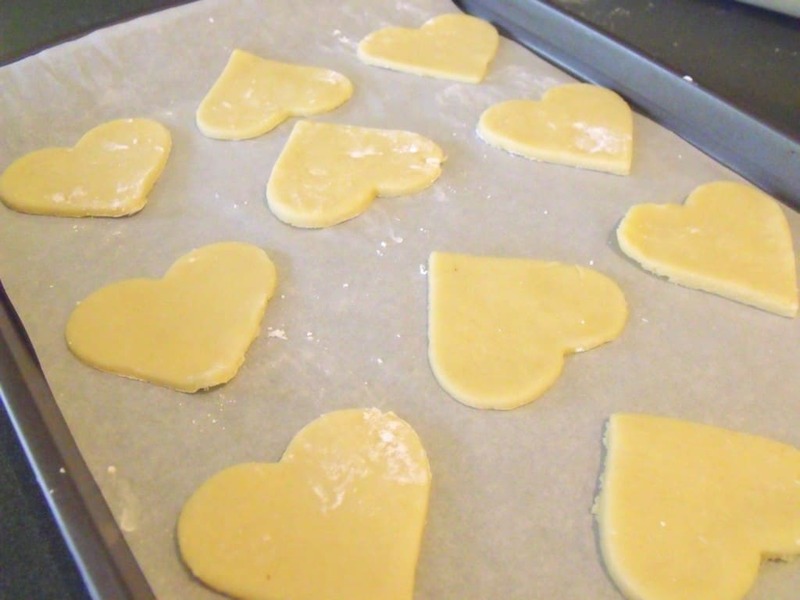 This cookie dough yields between 36 to 44 heart shapes (18 t0 22 sandwiches) depending upon the thickness of your dough. 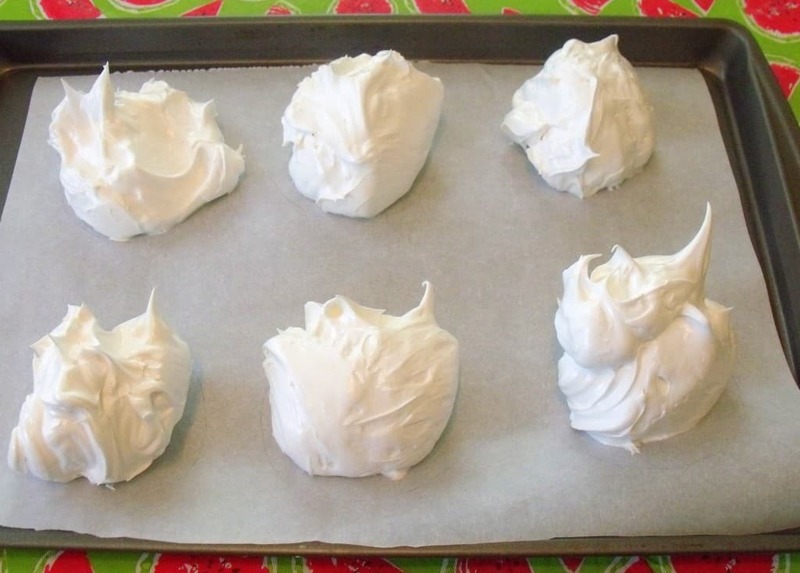 Place the cookies on a baking sheet lined with parchment paper. Cook for 10 to 12 minutes in a 350 degree F oven. Transfer to a wire tray to cool. 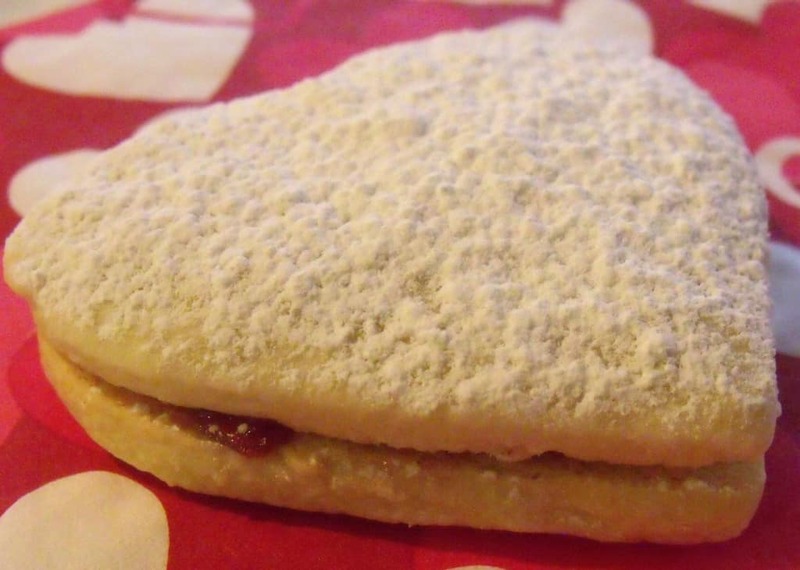 While the cookies are still slightly warm, spread some seedless raspberry jam on the bottom of one half of the sandwich. Squeeze two hearts together with the bottom sides facing in. 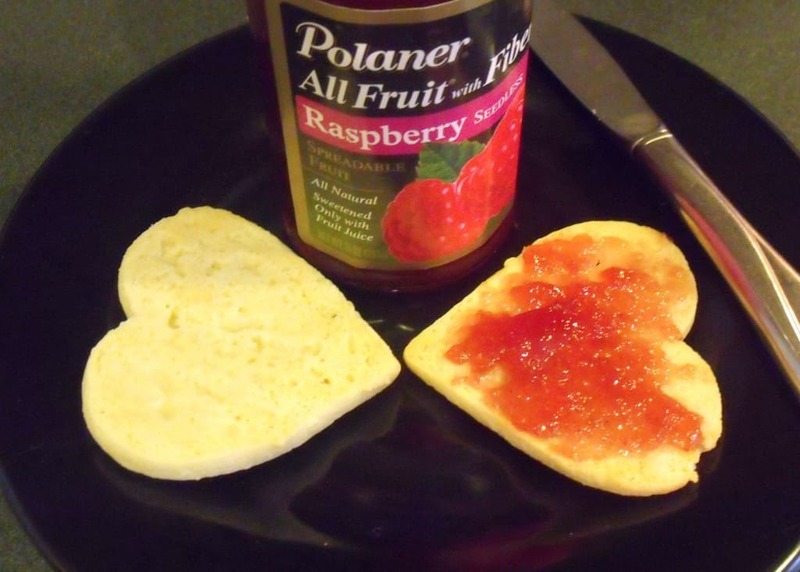 It is easier to spread the jam if the cookies are still slightly warm. Seedless jam works best. 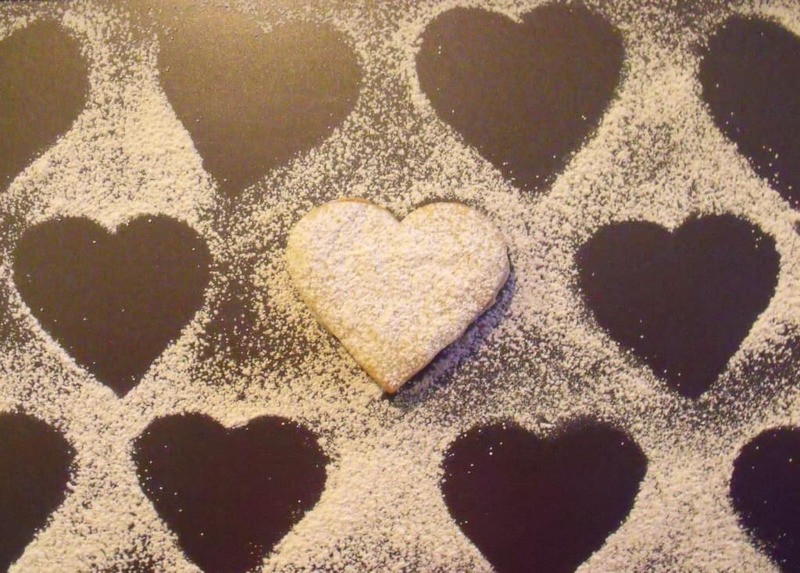 Cool the cookies completely, then place them back on a baking sheet to sprinkle with sifted confectioners’ sugar. A light snowy dusting makes them look ever so pretty. These jammy sandwiches are perfect for afternoon tea, or a cup of coffee. 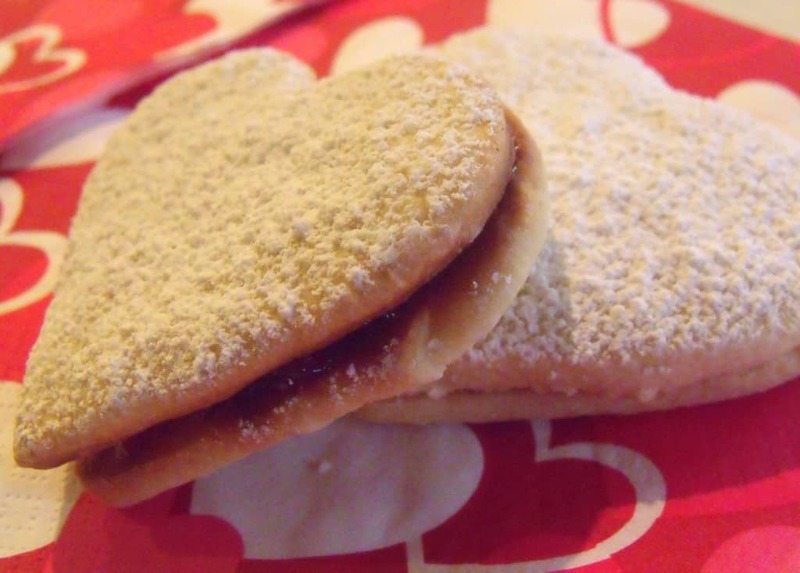 Basic almond cookie dough cut into heart shapes, then sandwiched with raspberry jam and decorated with a dusting of confectioners' sugar are a perfect treat for Valentine's Day. 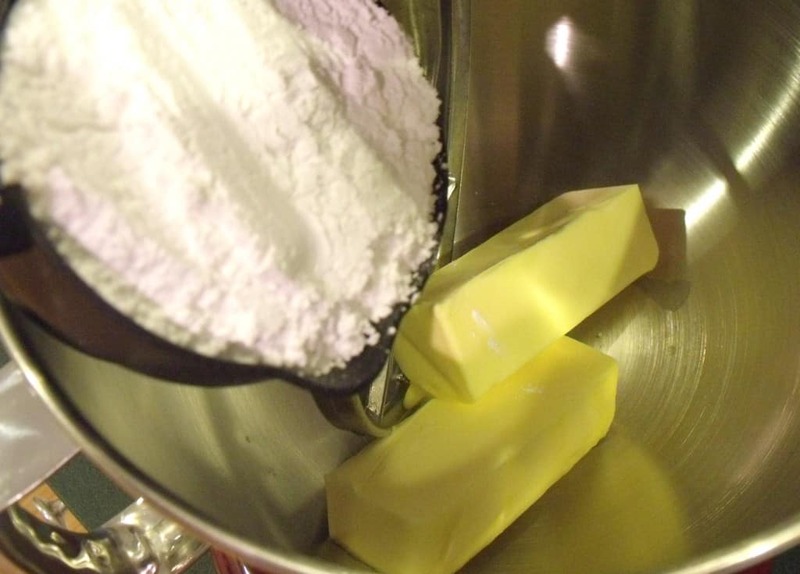 Step 1 Cream together the butter and 1 cup of confectioners' sugar until light and fluffy. 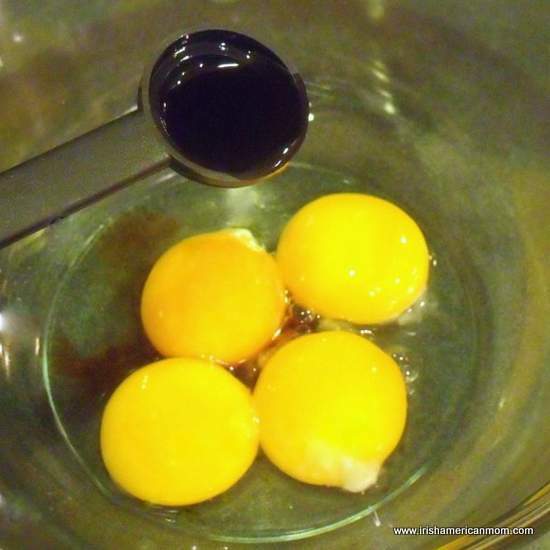 Step 2 Beat in the almond extract and egg. Step 3 Sift the flour, salt and baking powder in another bowl. Mix the ground almonds with the flour. 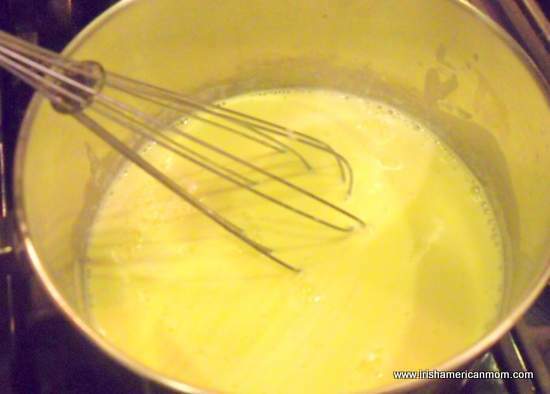 Step 4 Add one tablespoon of milk and 1/3 of the flour mixture to the creamed butter and egg. Mix thouroughly at low speed. 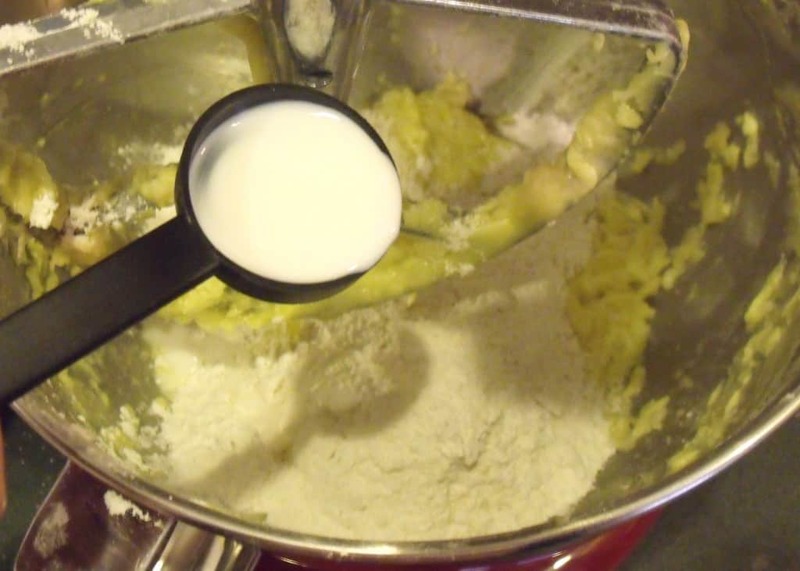 Add the rest of the milk and flour in two more batches, mixing to form a firm dough. Step 5 Knead the dough gently to form a disc shape. Cover with wax paper and chill for at least 2 hours. Step 6 To bake, preheat oven to 350 degrees F.
Step 7 Cut the dough in half, leaving the second piece in the refrigerator. 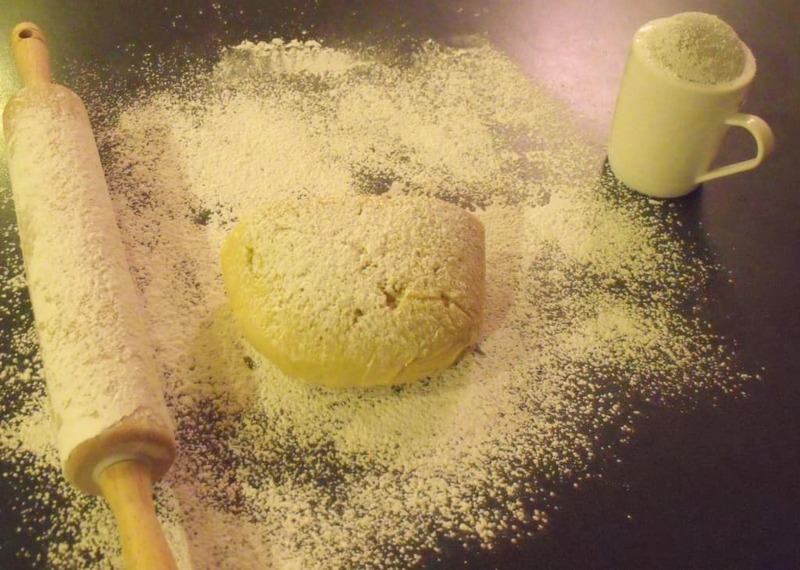 Dust the rolling surface with confectioners' sugar. 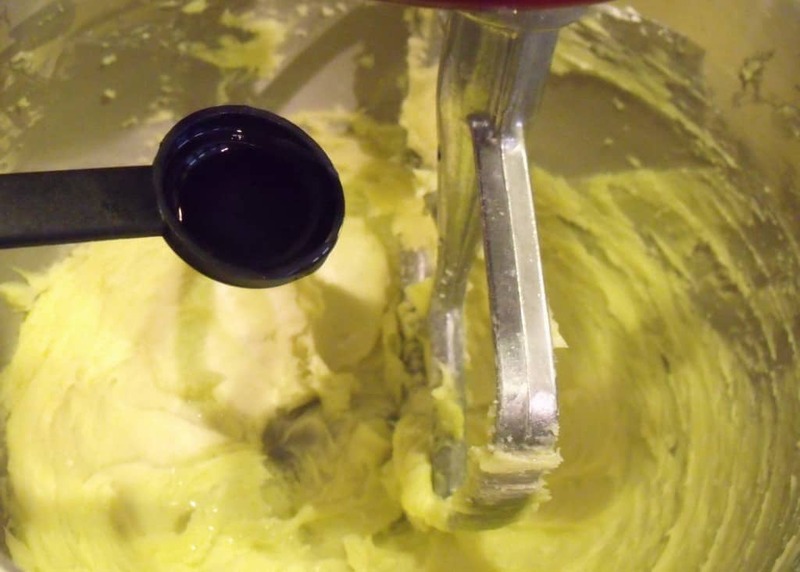 Roll out the dough to between 1/8 and 1/4 inches thick. 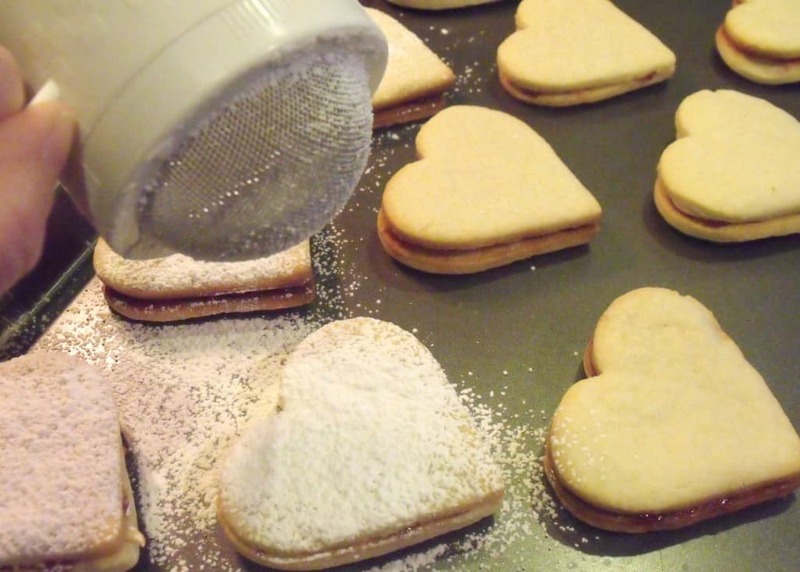 Cut out hearts with a cookie cutter. Reroll the scraps and remaining dough to cut and bake. Step 8 Transfer the cookies to ungreased cookie sheets. 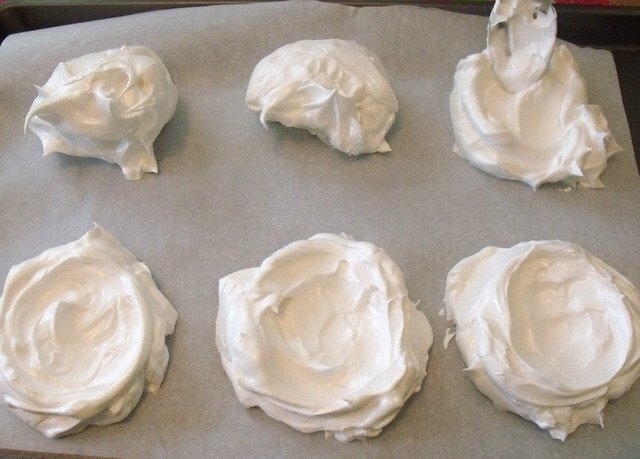 Bake for 10 to 12 minutes until the edges are turning slightly golden. Transfer to wire cooking racks when cooked. Step 9 While the cookies are still slightly hot spread the flat bottom of half the cookies with jam. Sandwich together with an uncoated cookie, bottom-to-bottom. Step 10 Let the cookies cool completely, then sprinkle with sifted confectioners' sugar to coat. Store in an air-tight container.